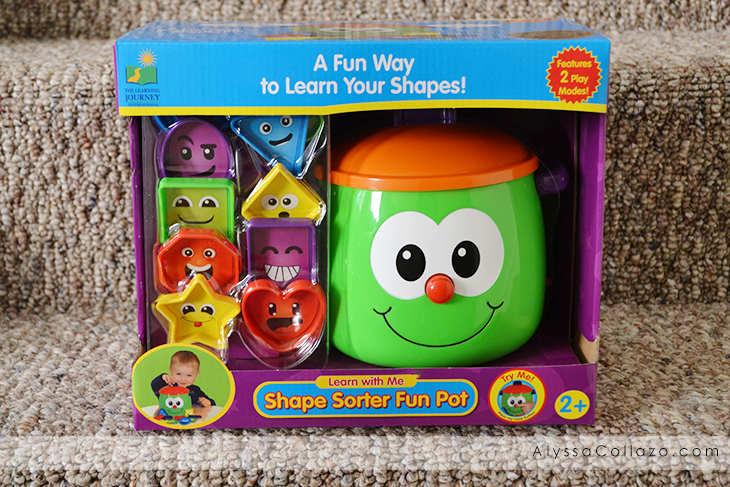 The Learning Journey Learn with Me Shape Sorter Fun Pot is a game that involves putting shapes into and pulling them out of a friendly cooking pot. It's great for teaching shapes! About The Learning Journey International The Learning Journey designs and manufactures the finest in children's interactive educational toys and games. Each of the company's products develops and builds on necessary skills children need for school and beyond. The company has won a number of awards, cementing the Learning Journey's reputation as one of the finest designers and distributors of educational toys in the United States -- and worldwide. Talking sorter pot with 2 play modes to recognize shapes. Includes 10 plastic shapes and a repeat button. Overall, this shape sorter fun pot is bright, cute and I love the educational value of learning shapes and following directions. My 3 year old loves finding the shapes and putting them into the pot, she plays with it everyday. My 7 year old also plays with it. It's really a great durable product and makes the perfect educational gift. I highly recommend this Fun pot. This looks like a great toy for little kids. I'm sure they'd have so much fun with it! Both of my kids had a similar when they were younger and they loved it! What a cute toy! I bet my niece would have fun playing with it. This looks like a great toy for kids! Plus it's educational too, which is always fantastic for kids! What a cute looking toy for the little ones. I love Learning Journey products. I will have to surprise my little guy with this for his birthday. That's so adorable, very cute little pot my daughter would love this cute stuff. My kids loved toys like this when they were that age! I love when they make the toys educational as well! My daughter had something like this when she was younger. She played with it for hours. Great learning toy for the little ones. This is a cool way to teach your children shapes and sizes while they are having fun. I remember having a game set similar to this when I was a kid. Well, it seems like the colors were the same! But also fun! A great toy to teach children colors, shapes and also improve their motor skills! My girls have had similar toys. Looks like a fun toy! This would make a great baby shower or birthday gift. Thanks for the idea. Perfect for the kids - they would have lots of fun and learning with these. Awww These are so cute. Definitely something I need to get my grandson. I can seee a lot of fun happening here. A new spin on a classic educational toy. Love it! The faces on the shapes are adorable too.